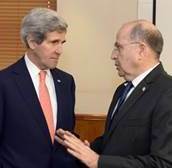 Based on his evaluation that the United States isn’t going to do anything to frustrate the Iranian nuclear program, Defense Minister Moshe Ya’alon said Monday he’s changed his mind and now leans toward supporting unilateral Israeli action against Iran. His words attest to a sea-change in his attitude regarding how Israel should contend with the Iranian nuclear program. Under the previous government, Ya’alon had led the opposition in the security cabinet to a solo Israeli attack on Iran, even exchanging sharp words on the issue with the defense minister at the time, Ehud Barak. Ya’alon had taken the position that “the work of righteous men shall be done by others” – meaning the United States should be the one to attack Iran’s nuclear facilities. Evidently, he no longer believes this is going to happen, and is nearing the position of Prime Minister Benjamin Netanyahu, who signals the belief that Israel should be behaving as though it’s on its own, right now. From Iran being “on its knees” thanks to economic pressure and onerous diplomatic isolation, from fearing an internal eruption and military threat, Iran cleverly led a “smile offensive,” Ya’alon said, extracting itself from crisis. Discussing the relations between Israel and the United States on the security and diplomatic fronts, Ya’alon said that U.S. military aid to Israel needs to be “seen in proportion”. “It isn’t a favor America is doing, it’s in their interest,” he said. Israel not only takes from Washington, the minister added — it also gives. “They get quality intelligence and technology,” he said. “We invented Iron Dome. The wings of the F-35 stealth fighter – we invented. We invented the Arrow,” an anti-ballistic missile. In a rare move, Secretary of State John Kerry protested Wednesday to Israeli Prime Minister Benjamin Netanyahu about strong criticism of US foreign policy by his outspoken defense minister. In a telephone call, Kerry told Netanyahu the comments made by Defense Minister Moshe Yaalon were inconsistent with strong ties between Israel and the United States, State Department spokeswoman Jen Psaki said. "Clearly his comments were not constructive," Psaki told reporters, after Yaalon accused the US administration of showing weakness around the world, particularly on its policy with Iran and Ukraine. "Secretary Kerry spoke with Prime Minister Netanyahu this morning and protested to him his concerns about these comments," she said, adding that the United States has an "unshakeable commitment" to Israel's security. "It is certainly confusing to us why Defense Minister Yaalon would continue his pattern of making comments that don't accurately represent the scope of our close partnership on a range of security issues and on the enduring partnership between the United States and Israel." But Kerry has a "thick skin" and "we're ready to move forward and keep talking about the peace process," Psaki added. In a later statement issued by the Israeli defense minister's office after he spoke with his US counterpart Chuck Hagel, Yaalon said: "There was in my comments no criticism or intention to offend the United States." "The strategic relations between our countries is of supreme importance as are personal relations at every level. I highly value the relations between Israel and the United States." When words like this are publicized in the name of "Israel", Jews everywhere have a renewed obligation to distance themselves from this "defense" minister who, far from defending Jews, is placing Jews in grave danger with his words.